Aside from being a skilled and valuable addition to the team, Jones is a recent graduate of The RE Store’s Community Jobs Training Program, which provides one-on-one job coaching opportunities in order to empower trainees to find long-term, fulfilling employment. We partner with various social justice organizations in the region, ensuring that our job training opportunities are accessible to all. Participants can come to The RE Store for an assessment of vocational abilities, to gain and develop job skills, or to help overcome barriers that may otherwise prevent successful employment. Jones first made his way into the Community Jobs Training Program through an injury. A Bellingham resident and longtime plumber, he had a freak work accident after shifting careers. “I was a plumber for 20 years and decided to give my body a break by moving to retail. One day while working with a pallet jack, I turned my body and somehow broke my back. The accident wasn’t bad, but as they say, it was the straw that broke the camel’s back,” says Jones. After his injury, Jones was left unemployed, with mounting bills and a broken body. He soon found his way to the Division of Vocational Rehab, a program of Washington State’s Department for Social and Health Services. The Division of Vocational Rehab works with participants to assess their current physical and mental readiness for re-joining the workforce. In order to assess his physical abilities after healing, it was suggested that Jones participate in a work assessment with a local organization. 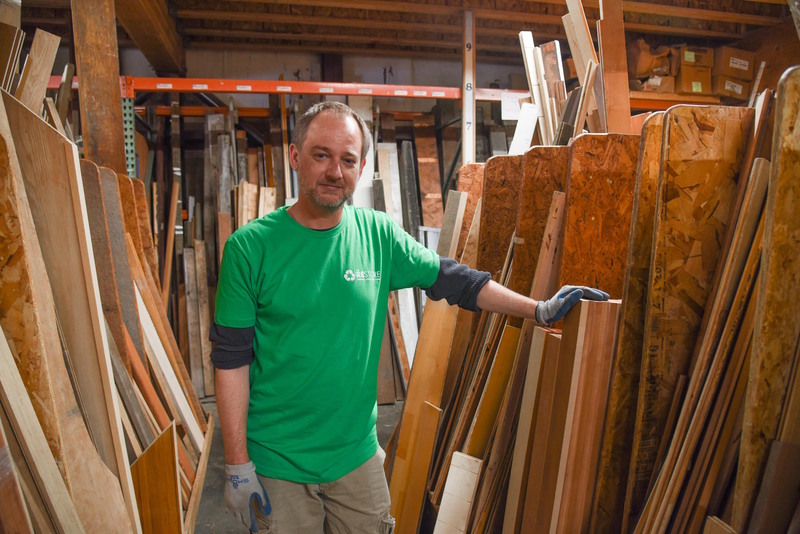 Upon mentioning his interest in the building industry, Jones learned that The RE Store offers job assessment opportunities through Community Jobs Training Program. “I’ve never been one that enjoys participating in mass market consumerism, so I appreciate The RE Store’s approach to retail. I’ve long been a shopper, so when I learned they were a partner I knew that I wanted to do my assessment there,” says Jones. Following Jones’ three-week assessment, he learned that he could stand for long periods of time, that he was able to safely lift and carry materials, and that could trust his body again. After his assessment, Jones moved into the WorkFirst Program, one of The Department of Social and Health Services’ employment services programs. Soon after, Jones found his way back into the Community Jobs Training Program, this time as a three-month work trainee. Jones joined the team in July, and we’re as excited to have him as he is to join the ranks. “I feel appreciated here and I’m told I’m appreciated. I know that appreciation to be sincere and it makes me feel confident and valued. Not only am I able to work, but I’m part of a social environment and able to educate people on the value of reused materials. I’m part of a really great team and am continually growing my confidence post injury,” says Jones. When asked why he’s excited to join the organization, Jones cited the values of resource conservation, sustainability, and education.